At Rosenthal Collins Group (RCG), we are committed to keeping our customers up-to-date on the latest futures margin requirements for the most actively traded futures exchanges around the globe. Please note that the information provided is for informational purposes only and no guarantee to its accuracy is made. All of the information is subject to change without notice—please consult individual exchange websites for the most up-to-date information. CME Group – CME Group is the world’s leading and most diverse derivatives marketplace. CME Group exchanges – CME, CBOT, NYMEX and COMEX – offer the widest range of products across all major asset classes, including agricultural commodities, interest rates, equity indexes, foreign exchange, energy and metals. Intercontinental Exchange (ICE) – ICE’s futures exchanges list a diverse range of globally relevant benchmark futures and options contracts including agricultural, currency, equity index and energy products. Eurex – Eurex is one of the world’s leading derivatives exchanges offering a broad range of interest rate and equity derivative contracts. 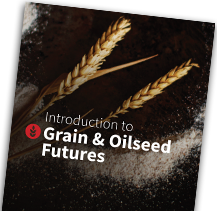 Minneapolis Grain Exchange (MGEX) – MGEX is the principal market for Hard Spring Wheat futures and options.